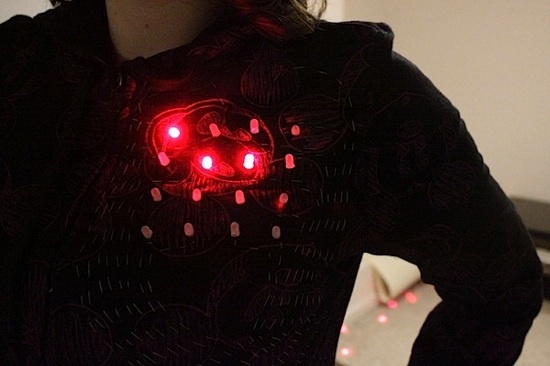 EKG-controlled Game of Life hoodie « Adafruit Industries – Makers, hackers, artists, designers and engineers! The concept is a wearable version of Conway’s Game of Life, that is controlled by the current state of your life. Essentially, a wearable extension of your heart, externalized in the form of Conway’s Life. A custom circuit includes an infrared EKG monitor that resets the Game each time a heartbeat is detected. Heartbeat data is analyzed by a hackduino which resets an ATMega48 chip, part of Adafruit’s kit controlling Life, which is embedded in the chest of a hoodie. Conductive thread is used to connect the 16 LED matrix to the circuit board which is kept in a pocket towards the bottom of the hoodie. Instead of resetting every heartbeat, why not move onto the next step every heartbeat, and only reset when necessary (on stagnation)?